Six degree mornings don’t have much going for them in my opinion. They need all the help they can get. If conditions are just right, special morning light can be that help. Winter mornings are not sunrise mornings for me. The wood stove goes out around three in the morning. Dawn brings a cold house. Sunrises are left to themselves as the floors are swept and the fire started in the stove. Only after that are winter mornings looked at. By this time whatever colors might have appeared for the sunrise are gone. Since winter mornings are overcast more often than not anymore, the color change is from purplish black to blue gray. I don’t find this very impressive. No picture really captures how special morning light sets off the trees along my Ozark creek when cold temperatures coat them in ice. Only some trees glow like this. I think it is a combination of the sun’s angle and where I’m standing that creates this moment. I’m glad it does. Now and then the sun puts in an appearance which is special morning light all by itself. Such occurrences must be spotted without forecasting help. This winter seems determined to prove the forecasters wrong about cloud cover as much as possible. The clouds simply refuse to leave. Clear mornings are a double edged sword. It’s wonderful to see the sun and have a sunny morning or, even more rarely, a sunny day. Having no cloud cover lets the temperatures drop. So the temperature dropped to six degrees. The moisture on the trees froze encasing them in a thin coating of ice. And the sun started sliding up over the eastern hill. 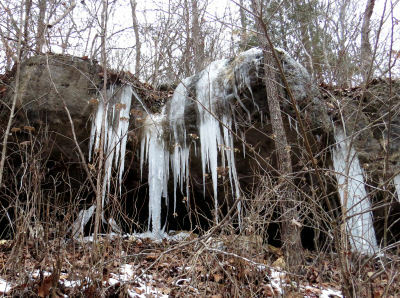 This winter has formed magnificent ice stalactites and columns on the bluff rocks along the road. Some are only a foot long. The biggest are easily six feet. Early in the morning the ice glows in the sunlight. What I’m looking at is that great shelter under the rock overhang. The Carduans find a similar an overhang. Ice is clear. Like water, ice has no color. 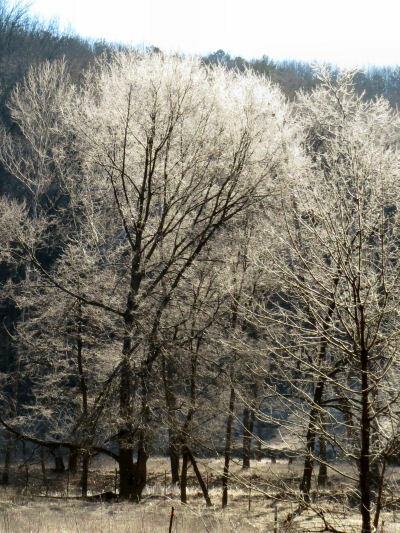 The trees shimmered as light refracted through the ice turning the trees into crystal works of art. Less than five minutes and the light show is over. The sun is up over the hill. The ice is melting in the trees. Like sunrises and sunsets, special morning light is fleeting. Catching a glimpse of it makes even a six degree morning special. Relax reading about the Ozark seasons in Exploring the Ozark Hills. This entry was posted in Ozark Hills and tagged winter ice formations, winter in the Ozarks, winter sunrise on January 29, 2019 by [email protected].